Lucky (2017) is an introspective, moving, and hilarious film filled with magic moments. It seems that Harry Dean Stanton was destined to play this part. The fact that it was the last feature released in his lifetime (and given the subject matter of the film) is just perfect. Actor and first time director John Carroll Lynch lets scenes play as vignettes, much like the style of Jim Jarmusch (and it's incredulous that HDS never starred in any of that director's films). 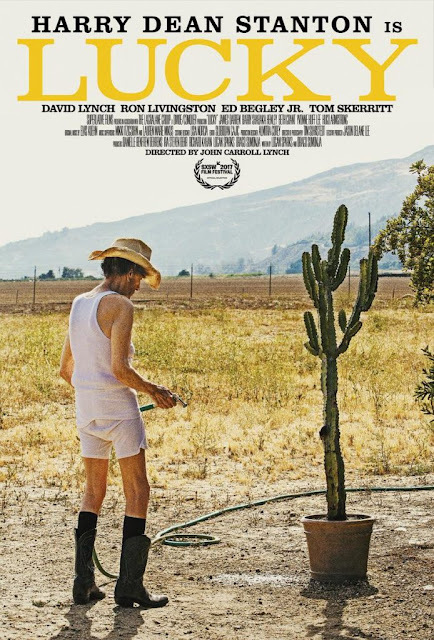 Lucky really is Stanton's showpiece, but most of the supporting cast is excellent too, including Stanton's friend and conspirator David Lynch who steals just a little bit of the thunder. Forgive the pun, but how lucky the world is to have received the gift of this film and this wonderful man.